Hurtigruten has had one of its biggest ships, the MS Finnmarken in Australia for the last 18 months. The ship has been rented out as a hotel ship on the Gorgon field. Now this contract is over and MS Finnmarken will return to the Norwegian coast. This will increase Hurtigrutens total capacity on the Norwegian coast with 10 per cent, because it will replace the old veteran ship MS Nordstjernen which was built all the way back in 1956. 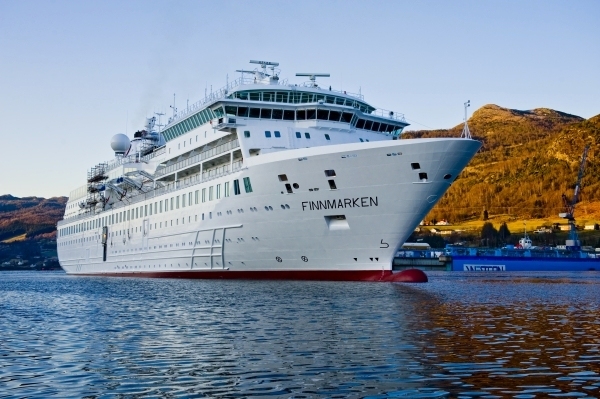 The Nordstjernen carries a maximum of 400 passengers, while the much bigger Finnmarken can carry 1000. Before MS Finnmarken can return to the Hurtigruten schedule on the Norwegian coast, it will have to go to a shipyard in Singapore to be set back to Hurtigruten standards. This will also include a paint job, because while the ship was in Australia it was painted in total white. MS Finnmarken will again be painted in black, red and white. All the Hurtigruten ships (excluding the two veteran ships) are sharing the same color scheme, and of course the distinctive Hurtigruten logo/brand. Under you can se a picture of MS Finnmarken at Westcon Yard, where she was modified and painted before the assignment in Australia. Modification included installing increased airconditioning capacity, and the car decks was converted into laundries and changing rooms. There was also installed a personell and provison elevator. Related post: MS Finnmarken back on the Norwegian coast 16th of February 2012! Written by Skipskatta time: 9:51 a.m.